Fishing duration this time of year is determined by thunderstorms. Usually we see storms building throughout the day and unleashing in the afternoon. Lately they’ve been starting in the morning, moving in from the gulf. This week I’ve been fishing within a short run of my home marina so I can return quickly if it looks ominous. Luckily my area has had great fishing nearby. 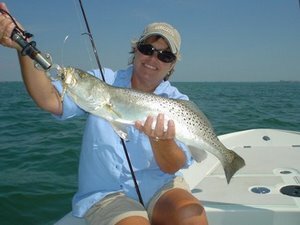 Trout are still inhabiting the beaches, but many are moving through the passes and foraging on the grass flats during the swift-moving tides. Greenbacks, hard plastics and plastic jigs are effective on all sizes of trout. Sometimes we have to weed through several undersize trout to the keepers, but the action is good. Snook fishing is still consistent, although the larger females are feeding less. The smaller males are still very active and responding to small pinfish, grunts and greenbacks. The beaches are still holding snook, however, the east side of all the barrier islands are showing high numbers of fish. The spawn is nearly over so they are moving east. Brian Caudill fishes from Clearwater to Tarpon Springs. He can be reached at (727) 365-7560 and captbrian.com.